Forever 21 is throwing another contest for all of you fashionistas! And this time, it’s bigger and better! Get the chance to be one of the 21 winners to get Forever 21 gift certificates, a shoot with me to be published on Meg Magazine and if you’re the most creative, a Samsung Galaxy Note 3 and Galaxy Gear Smartwatch! All photo entries will be reviewed and judged by Forever 21’s marketing team and myself. We’ll be basing your points on creativity (35%), originality (35%), caption (20%) and votes (10%). Everyone is qualified to vote. Just register on the website, log into your profile then click the “style hits” button of the entry you like. You can vote for as many entries you like. Cut-off period for voting is on October 6, 2013, which is also the deadline for submission of photo entries. 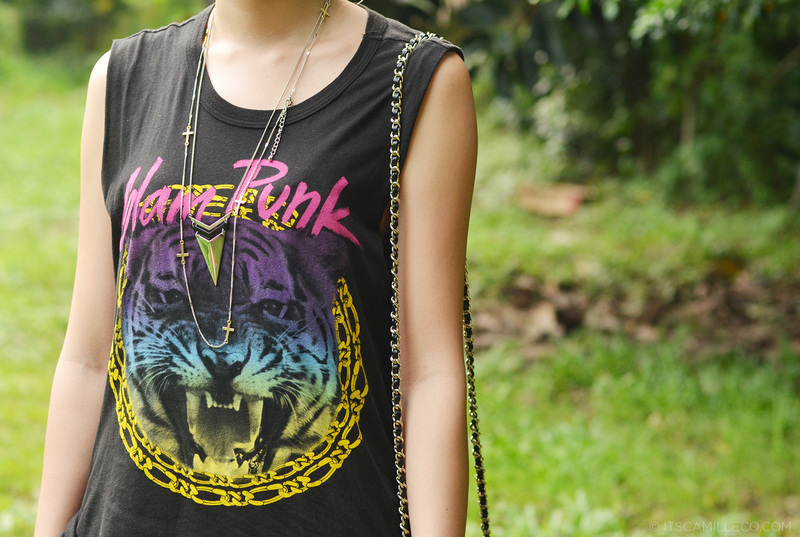 I chose this rocker muscle tee as my key piece. I thought I’d style it in a rock boho way and mix it with flowers and lace instead of the usual leather and cut-offs. This first look is my favorite because it’s the most unexpected of the 3. Who would’ve thought a dainty lace dress like this can look so edgy? I can definitely see this on free-spirited girls–the true bohos and indies. For my second look, I paired my rocker tee with floral jeans and gladiator heels. This look is for girls who are feminine yet know how to rock out. This is actually the reason why I chose this tee to be my key piece. Don’t you just love the shredded design on it? Make sure to accessorize your look! This is one powerful styling tool you’ll want to utilize so that you can differentiate your looks even more. 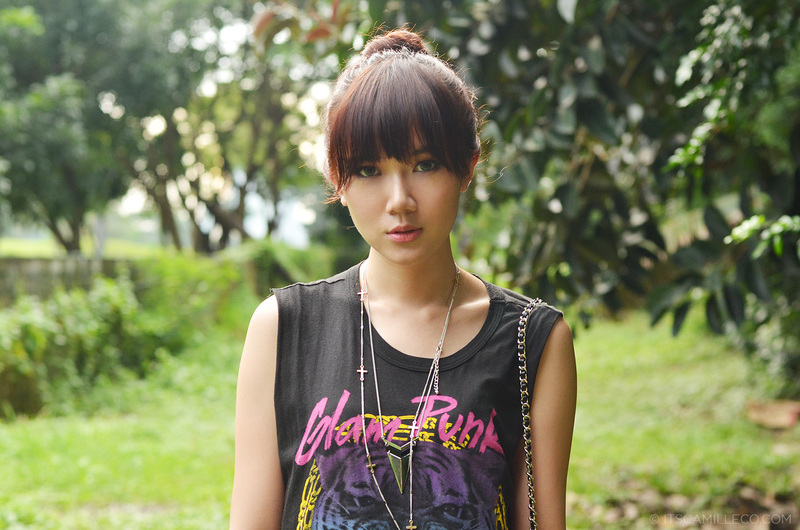 For my third and last look, I wanted to show how the sweet girl next door would style a rocker tee. It’s still in keeping with the floral theme but this time, it’s more polished than the 2 previous looks I showed. I hope you can see how the right fabric, cut, print and accessories can change your look dramatically. That’s what I want to see in your photo entries. Don’t be afraid to think outside of the box! Oh no. Maybe the photo wasn’t in the right dimension or size? It’s a dress! :) Wrote it down there too! Hi Ms. Camille! It’s been ages since I read your blog. Super busy ang graduating! Anyway, I love all your looks! When I first joined in lookbook, ikaw agad yung naging favorite ko and up to now I still look up to you as my fashion icon! Hope to see you again in the next BU2 or sa shoot ng Meg, hope I’ll win, the biggest prize is to be featured on a mag next to you! God speed! Thank you Abby! Good thing you still find the time to visit my blog :) Good luck! Whole day lang akong nakatingin sa page nato. I imagined myself wearing your first outfit. At hindi kinaya ng powers ko ang na imagine ko. Kakasuka! Ampangeet ko sa imaignation ko. HAHAHAHA. Hahaha don’t be too harsh on yourself naman! :) Yan ang kasalanan! :) Just go for it! i love that shirt!!!! last time i browse on the clozette i saw a shirt somewhat like that… but i’m worrying to order online… can you give some tips how can i buy online? u have a really nice ua! baby soft and smooth :) where did u have yours lasered? :) do you recommend it? :) will it give my ua the white soft and baby smooth effect too? thanks and more power! I believe so! :) Go to Facial Care Center! Can guys join the contest too?? pero nagsisimula palang ako . Does it have to be one piece of clothing (key piece) plus two other fashion pieces such as shoes, accessories, bags? Or we can also use three pieces of clothing from forever21 in a photo? Basta you have to have one fey piece from F21 in all three outfits then at least 2 more F21 items. So it can be key piece + F21 shoes in outift 1, then key piece + F21 pants in outfit 2 then key piece + other brands in outfit 3. Or you can opt to wear all F21. Doesn’t matter as long as there are at least 3 F21 items in total. Love the 2nd and 3rd looks! Love the sheer skirt with the graphic tee, perfect combo! Waaa! Dream contest~ F21 GCs+Samsung Galaxy Note 3+shoot with THE Camille Co!! Your shirt reminds me of those Balenciaga ones! The one that says “Join a Weird Trip” and has a Sphinx printed on it! haha! Love your mala-Chanel backpack! Sana makita ko pa sya pagpunta kong Forever! haha! I love your rocker tee with floral jeans and gladiator heels.. soft rock..